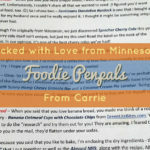 From Nicole: Due to a family vacation in March, my sister and I neglected to update for February and March for Foodie PenPals. Here’s what we received from this great program. For the February package, I received four types of teas (Darjeeling, Morocco Mint, Chamomile, and Bancha Hojicha), a chocolate grater, a chocolate bar, hemp hearts seeds, chai tea latte mix, edamame, spinach miso soup mix, luna cookie dough bar, yeast, fruit leather, dried porchini mushrooms, and almond butter to go pack. I just told her that I like to-go things (especially luna bars), tea, and Asian food. The mushrooms would taste great in the miso soup. I can imagine myself grating the chocolate over some risotto or a dessert like a pro. The almond butter tastes good squeezed on a fresh apple for a snack. 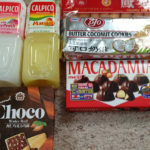 The edamame, fruit leather, and luna bar would be great in a lunch or as snacks! Thanks for my lovely and creative package, Jolie! For my March package, I received Salted Caramel Starbucks hot chocolate packages, Cookies BBQ sauce, apple cinnamon English muffin slices, apple butter, a nutz over chocolate luna bar, chocolate chai tea latte mix, chicken seasoning, and a wonderful card. I really loved the hot chocolate packets, even though there wasn’t much caramel taste. Who can resist the rich Starbucks hot chocolate? I got the double chocolate for Christmas from my mom and boy, is that sweet! My dad already was itching to use the BBQ sauce on some chicken and wings. He used it all already! He loves it and wants to order more from their site. At $2-something a bottle, that’s so cheap! Who knew that Iowa had a hidden gem like this? It was delicious. The apple butter was great and the luna bar was my favorite flavor. The muffin slices were great for breakfast too.Thanks for my perfect package, Sandy! 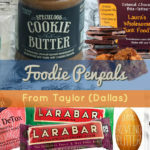 For more information on Foodie Penpals, follow the link below. 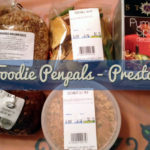 Hi I’m Ana from Fooduel.com. It’s easy,free, fast and fun. 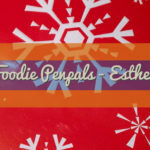 I invite you to enter, add your blog and upload a recipe with a nice photo for user of the world look your recipes. We would love that you participate with some recipe!